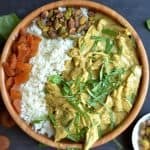 This easy Thai Green Coconut Chicken Curry has all the right flavors and textures: slightly sweet, slightly spicy, and packed with vegetables! 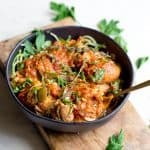 It’s sure to become a weeknight staple with the ease of your slow cooker or Instant Pot. 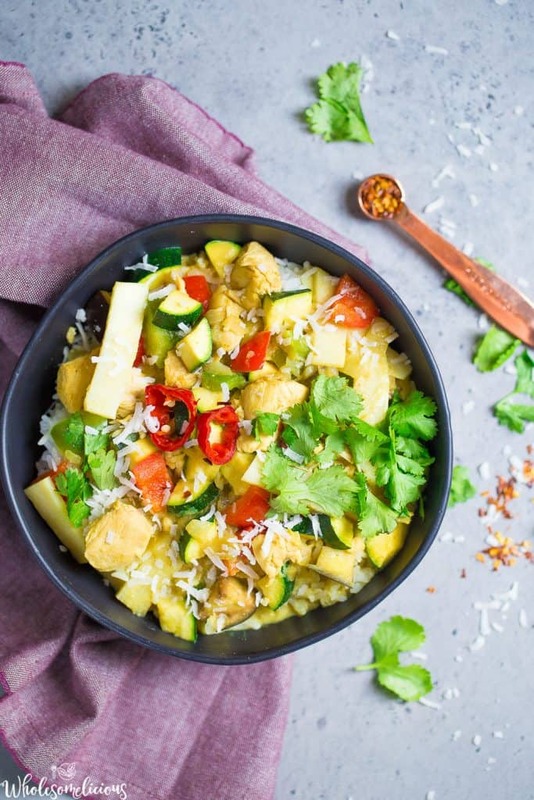 Today’s simple Thai Green Coconut Chicken Curry is inspired by the oddest of places: an airport restaurant. Yep. The place where most of us dread having to grab a bite, usually because the lack of healthy options and fresh ingredients. But let me tell you, Houston airport, you nailed it! 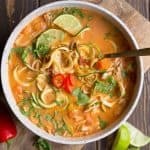 Part of my job includes trying new restaurants, interesting and unique dishes, and even looking at menus I love to gather inspiration to make my next favorite EASY weeknight meal. I keep a running list of recipe ideas that pop into my head, or ones I’ve tried at a restaurant, and write them down so I remember to eventually get around to putting my own twist on the meal. 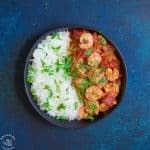 Some of my recipe ideas have been around for over a year, and I haven’t gotten around to making them! 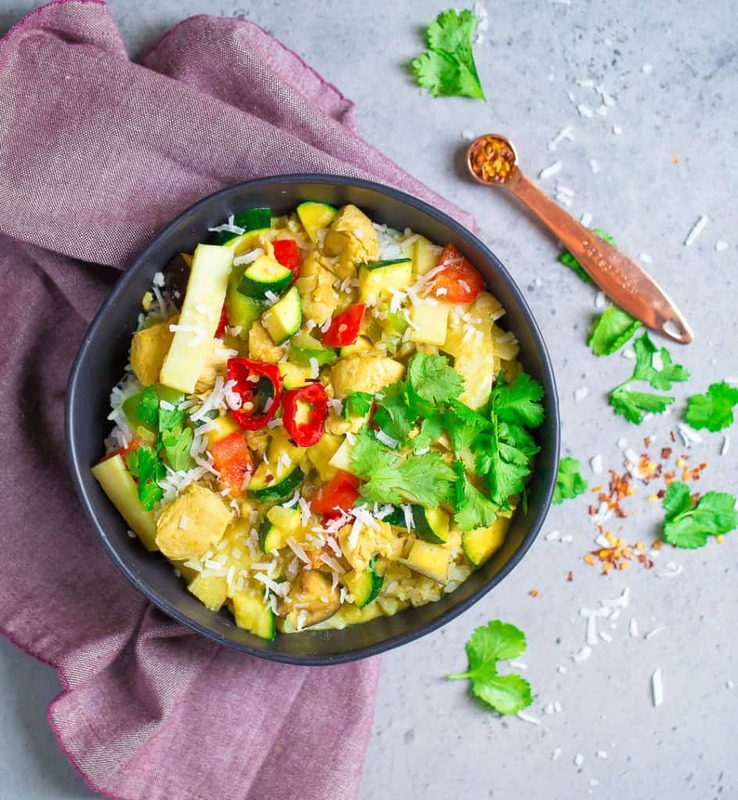 That is NOT the case with this Green Thai Coconut Chicken Curry. 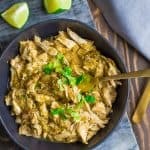 Curry is always a hit with my family, so when I was quickly grabbing a to-go meal I knew we would all like to eat on our final flight from Mexico, I knew a Thai green curry chicken bowl would be met with enthusiasm. I don’t even recall the name of the restaurant. I remember they had plenty of bowl and salad options, and that was all I needed to see! 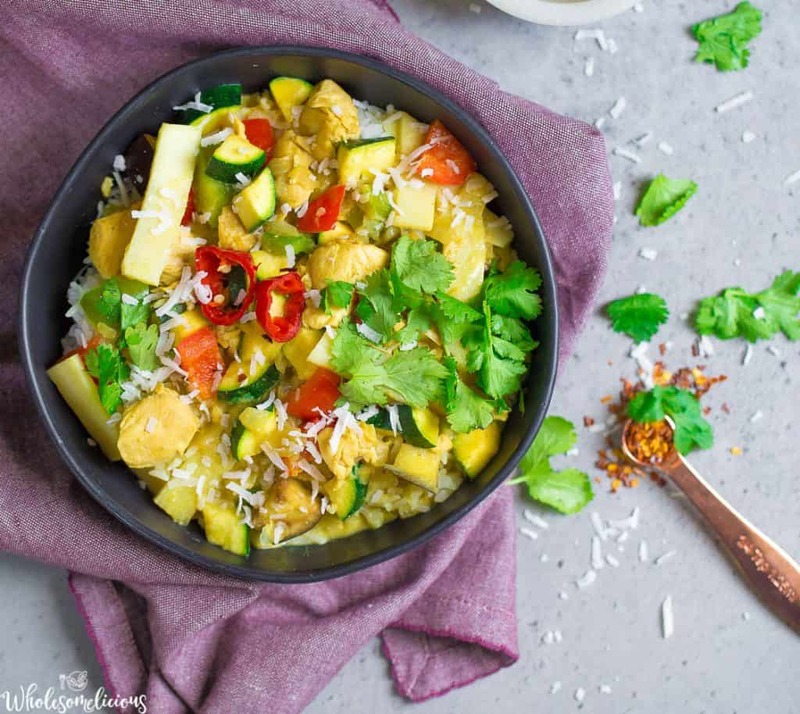 It occurred to me that because I didn’t have a green curry chicken recipe, this was a no brainer to put on the blog! Because I loved this dish so much, it quickly was moved to the top of the list to create and share ASAP. I loved the many textures, and the addition of shredded coconut on top. I added in some coconut sugar to give it a slightly sweet taste, feel free to omit for a Whole30 option! Also, adjust the spices as needed. More crushed red pepper will create a spicier dish, you can also use a small amount of a red chili pepper. Select the saute function on your Instant Pot. Once hot, coat the pot with oil. Now add onion and ginger. Stir and cook for 2-3 minutes. Stir in coconut milk, curry paste, curry powder, coconut sugar (if using), and fish sauce. Cook until slightly bubbly, and well combined. Select the cancel function, and add the chicken. Secure the lid on your Instant Pot, ensuring the valve is in the sealed position. Now select manual, cook on high pressure for 8 minutes. Use a quick release. Once steam is completely released, remove lid. Press cancel, then saute. 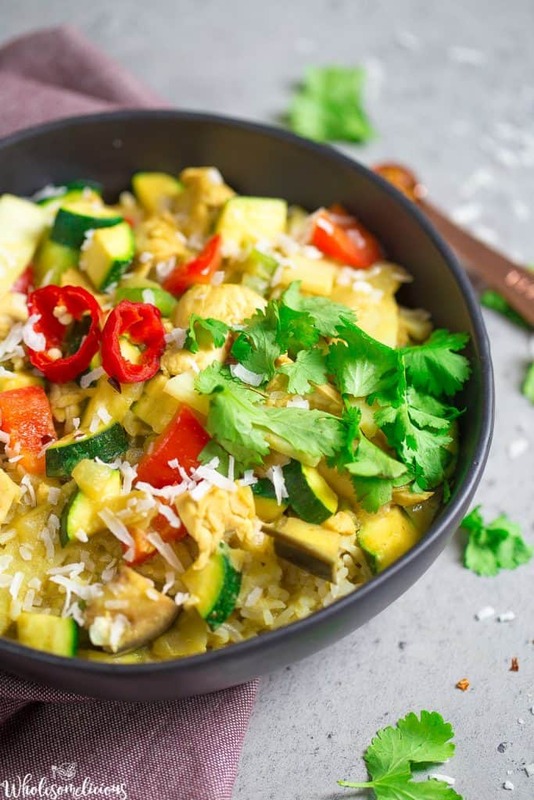 Stir in zucchini and bell pepper, and let cook for 3-5 minutes or until veggies are softened. Don't overcook! Select cancel or warm. Stir in lime juice, bamboo shoots (if using), and any pepper to add additional heat. 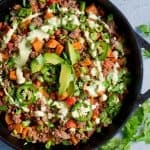 Serve over rice, or cauliflower rice. Garnish with shredded coconut and cilantro or basil. 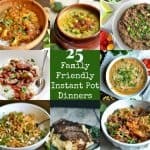 Tried this as my first time InstaPot recipe. Thought it an interesting take on a Thai theme. However, no way this is a 10-minute prep. It was easily 20-30 minute prep. Lots of washing and chopping. Added some leftover sweet potatoes with zucchini and peppers at end. Good basic meal. Used Mae Ploy green curry. Good spice. First, like the other commenter said, 10 min prep time in unrealistic. It’s more like 30 minutes. Agree on the prep time but mine turned out great. Nice combo of flavors!